This blog has been written for the Resilience and Wellbeing Network by Dr Jacqui Wilmshurst, chartered psychologist and workplace wellbeing specialist. Neurodiversity: you may have heard the term in the news. It is a relatively new term used to capture the range of neurological differences across such conditions as autism, dyslexia and dyspraxia. It’s not all about male computer nerds who don’t know how to speak to other humans. It’s about recognising diversity and being inclusive. Given that estimates put autistic people at just over 1% of the population and neurodivergent people as a whole at over 10%1, the connections to resilience and wellbeing at work are obvious. Neurodiversity is a phenomenon whose time has come. Even a quick search on the internet will bring up numerous articles about the rise in diagnoses for adult women (as well for young girls)2,3,4 and about the importance in recognising strengths and moving from an approach that seeks mainly to accommodate disability, to one that promotes true understanding and celebration of difference5,6,7. I am especially tuned into this because alongside being a psychologist specialising in workplace resilience and wellbeing, I am also autistic. For me, it is only a disability when I am not able to find or create the environments that are right for me. So here’s something personal on this topic – in the hope that you will find it enlightening and useful. One note of caution: “If you’ve met one autistic person, you’ve met one autistic person” (Stephen Shore). The caution is important, but it doesn’t mean that you can’t use my experiences to inform your approach. Whilst I’m hopeless at organising certain things (like the structure of this blog – luckily I have a fantastic editor on hand) and I have sensory issues (sustained exposure to bright lights and certain noises cause central nervous system symptoms), the focus I am choosing for this blog is social communication. This is because there has been substantial focus recently on how to accommodate sensory and executive function issues8,9,10 and relatively little coverage of social communication issues in the workplace. Social communication issues have personally caused me more stress and anxiety than the others and in many ways are seen as trickier to manage and make adjustments for. No, I can’t! Well, I can, so long as I’m not tired, overwhelmed or stressed myself. This is because to compensate I have developed a high level of what is known as ‘cognitive empathy’. My analysis and calculations are mostly conscious and deliberate rather than unconscious and intuitive. Interestingly, I have no problem reading underlying moods and energy and can often pick up what is really going on for someone (including when they’d rather I didn’t). What I don’t read are intentional communications that are either non-verbal or ambiguous/nuanced. I need clear, honest and direct communication. Without it I flounder. It is exactly what I offer others, and it often bemuses me to hear that I was supposed to be more ambiguous and dishonest in order not to attract criticism and irritation (if not outright anger). Such issues are great for building adaptability and resilience though. Without a formal diagnosis I had already formed a large number of workarounds for issues that I didn’t even know everyone else didn’t have. They have been pretty effective, but what they didn’t do was help with the internal anxiety and exhaustion that goes with this much effort11, not to mention not knowing when I’ve ‘got it wrong’, unless I ask or someone tells me in frustration. This can often bring about another “Can’t you just…”, which is: “…stop being so sensitive?” I challenge anyone who works this hard to be sociable and effective working with others, whilst also lacking the intuitive ability to read social signals (and often being dazzled by bright lights, too much noise and too many people), not to be always waiting for judgement or criticism. Related to this, there can also be a tendency when asked to share professional knowledge to get so enthused that I don’t know when to stop – not least given that one of my strengths is how much information I can absorb and retain on a given subject. I know that I share this with Chris Packham, who has Michaela Strachan on hand to give him a subtle nudge when he does it on live TV (inside information)! This can also lead to intense social anxiety, usually retrospectively, if I don’t get support or feedback. For all these reasons, there can be the assumption (seen towards the end of Chris Packham’s wonderful documentary Asperger’s and Me12) that it’s best if people on the autism spectrum are left to work on their own in a dark, quiet room. Except that this doesn’t work for a sociable, empathic, autistic woman, one of whose ‘special interests’ is psychology and facilitating health and development! So what would I ask for if I were back in employment (rather than self-employed), to help ease the burden and allow me to focus on my many strengths? Coaching or mentoring, ideally with someone who understands the specific challenges I face. For example, rather than avoiding social interaction, I have tended towards overenthusiasm, lack of boundaries and difficulty discerning other people’s intentions. In the absence of clarity, rather than trusting no-one, I’ve had a tendency to trust everyone. This is a sure path to disappointment and at times, exploitation. Having a workplace ‘buddy’; either in meetings or, if that’s not possible, then to talk to before and after (like Michaela to Chris Packham). Also, the opportunity to have a reflective learning conversation with my manager about any concerns I have relating to a given interaction, without judgement. Being free to educate others about how it is for me, rather than to be on the end of assumptions and stigma. For example, I want to be believed that although I am, for the most part, an articulate and apparently confident verbal communicator, this does not necessarily reflect what is going on for me on the inside. After social interaction, especially with multiple people and/or people I don’t know well, I need recovery time alone and in a quiet place. All these kinds of support reduce second-guessing, over-analysis and anxiety and leave me with valuable resources intact. In my case; cognitive abilities that include a rapid uptake and synthesis of new information, a very good memory and recall for the same, highly associative thinking that contributes to creative problem solving and a fine eye and ear for detail. I also have a large well of passion, energy and enthusiasm that, in the wrong environment, gets lost to the toil of trying to appear ‘normal’ and hoping desperately that no-one will notice that I’m not. On the plus side, as an antidote to the people who have not been kind, my diagnosis and subsequent selective disclosure has also led me to discover that lots of people already knew I wasn’t ‘normal’ and already thought it was wonderful. There is so much more that I could say on this but I promised this would be a reasonably short blog (although I still say why use 1,000 words when 10,000 would do…). 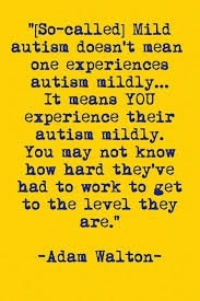 Thankfully I only have to be one in a growing number of autistic adults now speaking up about our experiences and what we need in order to thrive. I’ve added a little of my voice here and have included a reading list at the end if you find yourself wanting to hear from some of the others.